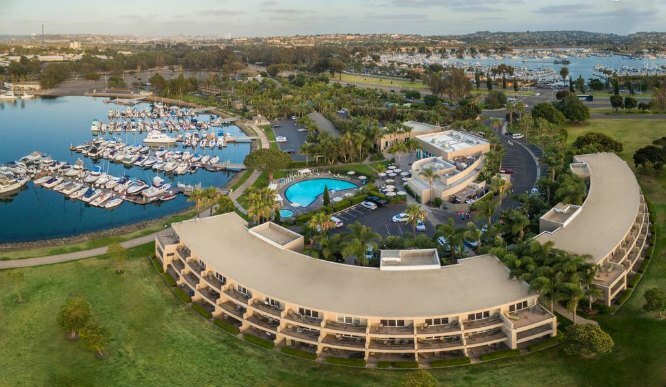 The Dana Hotel is a family and business-friendly waterfront resort on Mission Bay that is one-half mile from the Marina Village Conference Center. They offer comfortable guest room and two-room suites overlooking the bay and have an onsite restaurant. Complimentary shuttle service is available to and from Marina Village between 8 a.m. and 6 p.m. Airbnb is an excellent option if you would like to coordinate accommodations with other students. Rates do not include the taxes, currently totaling 12.695%. Hotel provides complimentary shuttle service to and from Marina Village based upon availability between the hours of 8 a.m. and 6 p.m. Sign up at front desk upon arrival. Firefly (onsite restaurant) serves breakfast, lunch and dinner. Resort Fee reduced to $17 per room per night (includes parking, wi-fi and in-room bottled water). Refrigerators, microwaves and in room safes in all rooms. Check in time is 4:00 p.m. and check out time is 1:00 p.m.
Upgraded room types are available at an additional cost; based upon availability. Please call the The Dana’s Reservations Department at 800-445-3339 or 619-222-6440 and ask for AcuSport Education. Rates are available up to 30 days prior to each session start date. A limited number of rooms are being held at these rates so be sure to reserve early to guarantee your room.